It is difficult to recall successful pairings of robotics and rock. A casual look back at their scant joint history recalls a relationship grounded largely in regrettable theatrics and whimsy — thank you very much, “Mr. Roboto.” Thankfully, Bill’s Robot are robotic in name only. However, the local duo’s debut EP is also more journey back in time than contribution to futuristic rock innovation. In an era when folk-rock seems to rule and popular notions of the guitarist have returned to that of the plucky balladeer, Bill’s Robot guitarist Jason Couture gamely wails in the increasingly rare stadium-rock vein. While he is an undistinguished and flimsy vocalist, Couture’s instrumental interplay with drummer Bill Cooper makes Bill’s Robot hum. Cooper is also a bit of a throwback: a competent and forceful hammerer who mans a thunderous drum kit throughout each track. His double-bass-pedal work on cuts such as “Caught in the Middle” is particularly impressive — especially on such a distinctly guitar-driven recording. Lyrically, Bill’s Robot appear to be running low on batteries. During the awkward cadence of “Just Enough Rope,” Couture sweeps in to save the track with a whirling, but all-too-brief, solo. The EP has several other fleeting moments of sophisticated and dramatic electric guitar work, such as in the waning moments of the EP’s finale, “Wasted Friend.” The high points of this recording are like homemade versions of the epic, guitar-rock clatter frequently blasted before commercial breaks on nationally televised sporting events. Unfortunately, this duo ventures into treacherous terrain near the EP’s conclusion, specifically, hard-rock balladry. On “This Is Mine,” Couture trades his distortion pedal for an acoustic guitar, which is unnecessarily supplied with bristly, synthetic hair-band-era reverb. On the aforementioned “Wasted Friend,” the band is overly concerned with vocal harmonies that forsake the uncomplicated hard-rock aesthetic. 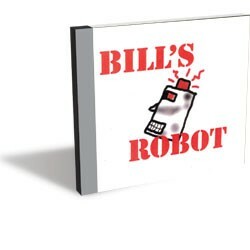 Despite some glitches, Bill’s Robot avoids the scrap heap and should leave listeners curious to hear an update — which one hopes will further embrace Jason Couture’s virtuosic shredding.